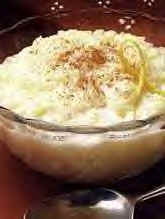 Rice Pudding is a delicious everyday family treat that can also be served up with elegance at a party when served in fancy dessert cups or bowls! In medium saucepan, combine water, rice, cinnamon, lemon rind and salt; let mixture stand 30 minutes. Bring mixture to a boil, stirring occasionally. Add Eagle Brand; mix well. Return to a boil; stir. Reduce heat to medium. Cook uncovered, stirring frequently, 20 to 25 minutes or until liquid is absorbed to top of rice. Cool (pudding thickens as it cools). Remove cinnamon stick and lemon rind. Sprinkle with additional cinnamon. Serve warm or chilled. Refrigerate leftovers. Tip: Serve in decorative dessert cups or bowls for a more festive look at your next social gathering.